Salauris, as the Romans originally called it, has a great deal of history behind it. After the Romana and the Saracens, Salou was considered part of the Tarragona religious heritage. King James I was the first to sing the praises of its excelent port and decided to bring his entired fleet here. He disembarket from the Port of Salou to conquer Majorca an 6 September 1229. 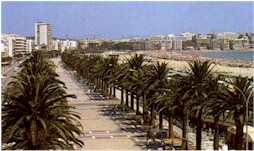 The inhabitants of Salou have always commemorated this event and that's why the main promenade is named after him. But pirates and privateeres didn't take long to discover this port as well and they turned it into one of the principal sites of their looting. As a result, the area became less inhabited and in 1530 the Archbishop of Tarragona, Pere Cardona ordered that a defense tower, now called Torre Vella or Old tower be build. In 1766 the Santa Maria del Mar Church was consecrated and shortly thereafter the road from Reus to Salou was build. In 1858 the lighthouse on Cape Salou was inagurated. Beach huts were authorized 1863 and in 1865 the train station began operating. The well known Reus-Salou Carrilet local train was inagurated in 1887 and brought the first summer tourist to the town. From the early 20th. century to the 1960's Salou grew sharply as a resul of turism, making Salou what it is today a beatiful and cosmopolitan summer town.